Missouri’s 2018 graduating class earned an average composite score of 20 out of a possible 36 on their ACT test. The exam is used to help determine how prepared students are for college. According to the ACT organization, 22% of Missouri graduates met all four ACT college readiness benchmarks in 2018, compared to 23% in 2017 and 29% of 2014 graduates. Nationally, 55% of the class of 2018 took the ACT, with a composite score of 20.8. In math, 33% of 2018 graduates met the college readiness benchmark, 56% met the English benchmark and 41% reached the Reading benchmark. Students who took more advanced math and English classes had higher average scores than those who did not. About 65% of students who took at least four years of English met the benchmark, compared with 35% of students who took less than four years of English. In math, 41% of students who took three or more years of math classes met the benchmark, compared with 4% who took less than three years of math. Interestingly, 47% of students who took three or more years of social studies met the reading benchmark, in contrast with 31% of students who took less than three years of social studies. The data also shows that the racial gap in student achievement continues. Asian students have the highest average score of 23.2, followed by white students with 20.9, Hispanics earing an 18.7 and African Americans with 16.5. All of the scores are slightly lower from the previous year. The ACT office says 82 Missouri students in the 2018 graduating class received a perfect score. A list shows the perfect scores were earned by students in every region of the state. More than 68,000 Missouri students took the ACT as 11th graders. Missouri was among 17 states in which 100% of the graduating class took the exam. 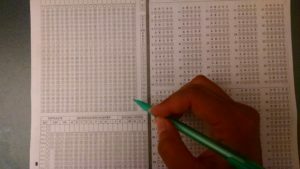 Missouri’s composite score of 20 was the sixth highest among those states, tying with Montana and Wyoming. Nearly half of the Missouri class of 2018 took the ACT more than once. More than 34,000 graduates in 2018 took the ACT two of more times for an average composite score of 22.6, compared to an average of 17.6 for graduates who took the test only once.